Newsletter printing services is a powerful strategy in communicating with your leads and customers, and is also one of the most cost-efficient ways to do so. Newsletter printing services allows businesses to deliver valuable information in a professionally designed, beautiful well-written document to customers and potential leads. It doesn't matter if your business has an important news announcement, special offers and close-outs, or another message to deliver; newsletter print marketing does it all. If you are searching for a personal and active path of communication with your prospects and customers to keep your brand name in their mind, newsletter printing services is the way to go. Newsletter printing services is utilized by businesses of all sizes to update, advise, remind, notify and communicate with customers and leads about current events. This effective direct communication builds brand awareness and stimulates direct interest in the products and services being offered by your business. A newsletter is never used as a salesy promotion, but is a subtle cost effective marketing tool to promote your business. One of the best things about newsletter printing services is that even the smallest of companies can reap the benefits without breaking their budget. 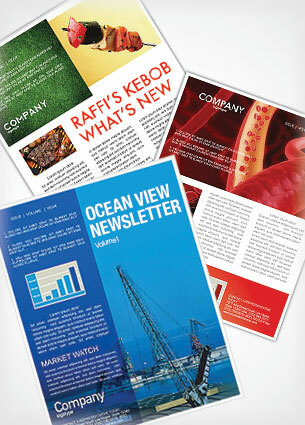 If your business has a tight budget, frequent newsletter printing services are still very feasible. We offer economy newsletter printing in B&W or full color inkjet which are significantly less expensive than full color digital printing or offset press on smaller runs. You even have the option of sending multi-page booklets as newsletters. Timing is critical. For instance, if your company is in the HVAC business, then using newsletter printing services prior to summer and fall are critical to get the attention of your customers and leads. Sending out your newsletters too early or too late can lessen the impact of your message across your targeted audience. Contact us today for a free consultation on how newsletter printing services will help your business grow sales and build customer loyalty. There is no reason to leave your marketing campaigns to chance when you can implement newsletter printing services for the utmost in professional appearance, personal touch, and the dynamic edge that immediately captures your audience's attention. In addition to increasing sales, newsletters are proven successful in deepening customer loyalty while increasing company and brand awareness. Newsletter printing services gives your company the ability to deliver credible information to help your customers in multiple ways; improving their situation, offering solutions to problems, or teaching them new and relevant ways to increase their business. With this soft-sell approach, your customers are able to see that you are offering them much more than just your services and products. In order for your newsletter marketing campaign to be effective, the information should be more informative than promotional and be done frequently. A consistent, frequent delivery of newsletters allows your company to discuss relevant subject with your customers while laying the foundation for future sales. When used in conjunction with other direct mailing services, such as after sending personalized letters and postcards, you can count on keeping your customers and leads interested in what you have to say and the information you are sharing with them. After sending initial direct mailings to your customers, stay consistent with follow-up newsletters to keep them tuned in to what is going on in your industry, organization, or business. Newsletter printing services allows for your customers to see the knowledge and expertise your company has in its related field.